On July 12, an exotic structured security that was trading at approximately $25 per share was suddenly redeemed at $14.69 by its issuer, Wells Fargo Advisors. Needless to say, some investors were surprised by the event, which did not appear to be anticipated by the market. Indeed, the securities--Floating Rate Structured Repackaged Asset-Backed Trust Securities Certificates, Series 2005-2 (abbreviated STRATS 2005-2)--had embedded risks that resulted from repackaging the same underlying cash flows several times. The story begins in 2004, when a subsidiary of JPMorgan Chase issued the JPMorgan Chase Capital XVII Capital Securities, Series Q, a type of security known as a trust preferred security. Trust preferred securities were a way for financial institutions to raise capital in a tax-efficient manner (see our paper on preferred stock portfolios for more details). Instead of issuing fixed-rate bonds, which required periodic interest payments, the banks would create special purpose companies that issue securities and pay 'distributions' at a fixed rate. They would fund those distributions by purchasing junior subordinated debt of the parent bank, in this case JPMorgan Chase. In effect, the bank could raise money from investors but pay 'distributions' from the special purpose company instead of interest payments to bondholders. For many years, trust preferred securities were allowed to be considered Tier 1 capital, making them a highly advantageous source of funds. Some of this trust preferred security was purchased by Wachovia Securities (later to become Wells Fargo Advisors), which combined them with an interest rate swap to convert their 5.85% fixed-rate payments to a floating rate payments floored at 3% and capped at 8%. 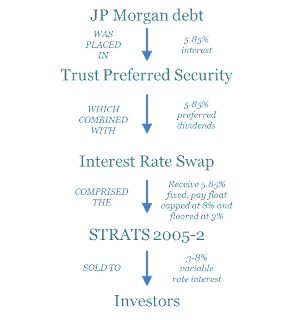 This repackaged trust preferred security plus interest rate swap was therefore a floating rate security based ultimately on JPMorgan Chase's junior subordinated debt. What was apparently not well appreciated was the fact that most trust preferred securities contained provisions that called for early redemption if their regulatory treatment ever changed (if they could no longer be treated by the bank as Tier-1 capital -- referred to as a "Capital Treatment Event"). 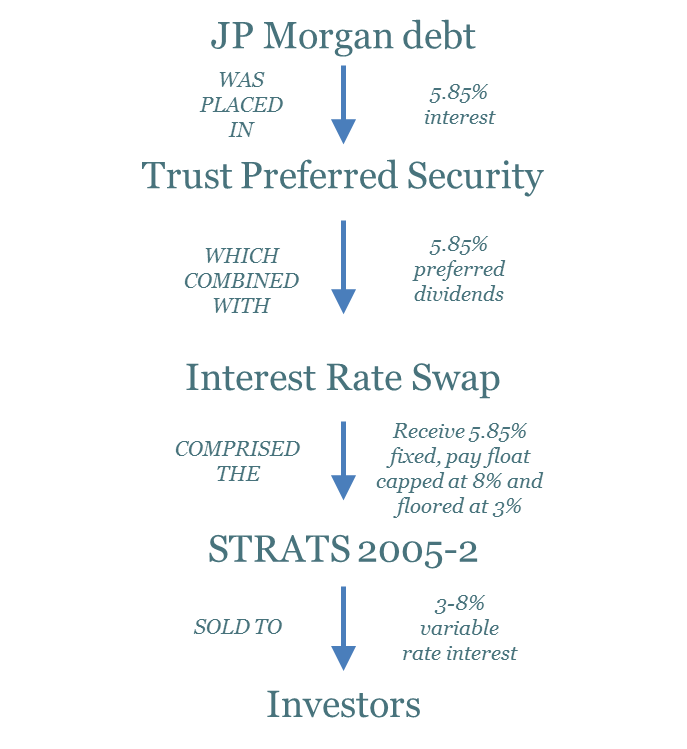 Interestingly, this is precisely what happened to the JPMorgan Chase trust preferred securities underlying the STRATS 2005-2: under the Dodd-Frank Wall Street Reform and Consumer Protection Act of July 2010, trust preferred securities were no longer to be treated as Tier-1 capital, and many have been redeemed since. This caused the STRATS 2005-2 product to unravel. JPMorgan eventually announced that they would be redeeming the trust preferreds at $25.65, removing the fixed-rate cash flow to the STRATS. All that remained was the interest rate swap, which Wells Fargo determined to be worth $10.97 per share, leaving investors with a $14.69 payout. It is not clear whether Wells Fargo's valuation of the swap was fairly priced; however, what is clear is that the market did not successfully price in the redemption risk which was effectively inevitable. The market price of the STRATS 2005-2 did not move drastically in response to the passage of Dodd-Frank, but jumped to near par when the Federal Reserve announced the impending regulatory change for trust preferred securities on June 7, 2012 (PDF version available here). Clearly, investors believed that they were entitled to full repayment of the trust preferred securities, not to the value of the trust preferreds net of the interest rate swap. The moral of this story is that structured finance can lead to surprising risks. Repackaging securities into a larger structure requires issuers to anticipate every potential outcome for the underlying securities, and to fully disclose the effects of those risks to investors. In this case, it appears that an unexpected event that disrupted the market for one security caused a chain reaction that led to substantial losses in another. This example highlights the highly interconnected risks that can come about due to structured finance. Isn’t repackaging securities more or less the same as interest rate swaps? Manipulation? Although this particular repackaging was facilitated through an interest rate swap, repackaging securities need not involve such an instrument. Repackaging is about changing exposure and in this way it is analogous to an interest rate swap. In our view, more levels of complexity engender a greater likelihood of manipulation, but it is not guaranteed. Thanks for the comment and we hope you're enjoying the blog.